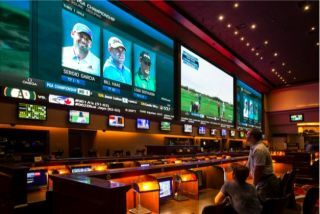 The Red Rock Resort in Las Vegas installed three NanoLumens 2.5MM NanoSlim Engage LED screens creating 1,730 square feet of content in its Race & Sports Book. The new installments, as well as three new 12-inch tall scrolling screens as footers, are the largest of their kind in North America and feature 4K resolution. The new canvases were installed by Las Vegas-based National Technology Associates and replaced 18 video projectors — six per screen — that were more expensive to operate and maintain. The three new NanoLumens 2.5MM NanoSlim Engage screens offer brighter pictures and reduced HVAC energy costs. The modular nature of the NanoLumens technology allowed for the screens to fit into the spaces left by the previous video technology. The sports book was able to operate as normal with one screen being replaced while the other two remained on. At the beginning of the development process, Red Rock Resort’s management and NTA consulted with NanoLumens about what would be possible for its race and sports book experience to continue to compete with casino technology.